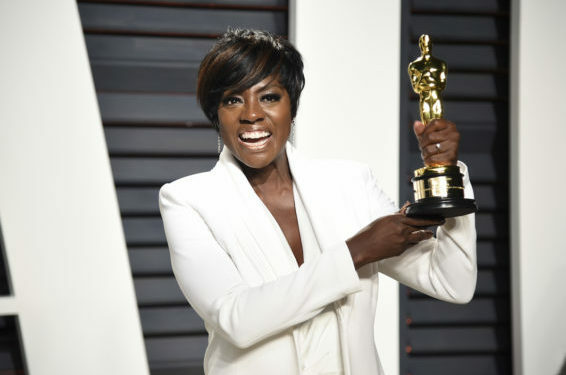 Viola Davis, a Juilliard alum, has had quite the impressive journey. After winning a 2001 Tony Award for Best Featured Actress in a Play for her portrayal in the original production of King Hedley II, she power-walked into her breakout film role in Doubt, which earned the actress her first Oscar nomination. Once critics and audiences alike saw her accomplish the seemingly impossible–stealing a scene from Meryl Streep–her fame skyrocketed into oblivion. Davis went on to portray powerhouses in The Help, Shondaland’s How to Get Away With Murder, and mostly recently Fences–each of these roles brought the actress an array of accolades. Davis has cemented herself in history, having achieved the “triple crown” of acting by winning an Oscar, Emmy and Tony. She is the first Black actress to do so for acting (though Whoopi Goldberg also has all three, she received a Tony award for producing) and the 23rd person to do so–ever. Davis is likely EGOT bound, too. Moreover, the actress is the only woman to have won an Oscar, Emmy, Tony, Golden Globe, SAG award and a BAFTA award, the British equivalent of the Oscars. Given her trajectory, the comparison to Streep was inevitable. After all, Davis has racked up awards and nominations in the same vein as Streep–who, with 20 Oscar nominations, has been hailed as the prototype for young actors–and has been universally touted as a flawless thespian. Plus, Davis and Streep have a longstanding personal and professional relationship rooted in mutual respect. Moreover, both women have similar educational credentials: Davis graduated from the prestigious Juilliard School, while Streep completed her MFA at the Yale School of Drama. Their paths to theatrical tutelage, however, are very distinct. Streep was the daughter of a commercial artist and art editor and experienced a privileged childhood, while Davis made her earthly debut on a South Carolina plantation as the daughter of a horse trainer and grew up in crippling poverty in Rhode Island. I can’t help but imagine that the inspirations both women called on throughout their lives were as vastly different and unique as the characters they’ve played. Streep and Davis are also known for both being outspoken in the fight for diverse representation, but Davis’ experiences are colored by her perspective as a Black woman. The actress told the whole truth and nothing but the truth when she made history, becoming the first Black actress to score an Emmy for Outstanding Actress in a Drama and declared, “The only thing that separates women of color from anyone else is opportunity. You cannot win an Emmy for roles that are simply not there.” And she’s working to change things. Davis and her husband, Julius Tennon, founded JuVee Productions, a company working to bring more Black stories to the masses. And therein lies the stark difference between the two. Streep champions women, but when Black women are so often left out of the conversation, Davis is there for us because she is us. Comparisons within peer groups are made all the time. But to call someone the Black version of a White person is diminishes their abilities. Also, should another–less melanin-blessed–actress procure an Oscar, Emmy, Tony, Golden Globe, SAG and BAFTA award like Davis, we would never ever hear her called “the White Viola Davis.” Why? Because White is the Windows 95 clouds wallpaper of life. White artists are never “othered” the way their counterparts of color are because they are the default. And quite frankly, I am beyond annoyed that Davis’ accolades have been attributed to an entirely different artist’s career, NOW IN BLACK!